The J.B.'s were touted as the original James Brown band, but that's not technically true. Brown formed the collective in the aftermath of his first band's disillusion over monetary issues, his first house band (separate from the Famous Flames) having been around since the late '50s. The J.B.'s were actually Brown's band from 1970 until early '80s, a distinction muddied by their consistent covering of Brown's material from the mid-'60s such as "Papa's Got a Brand New Bag," "I Got You (I Feel Good)," and "Cold Sweat," songs with which no one in the band was originally involved. This didn't seem entirely necessary considering the depth of the catalogue Brown produced in the '70s, as well as a half-dozen or so albums the J.B.'s put out under their own name, which were also produced by Brown. That said, other than nerds like myself, those anachronisms likely didn't enter anyone's mind. People came for the funk, the whole funk, and nothing but the funk, and that's precisely what they received. Each member of the eight-piece band has decades of experience under their belts, and they all had a chance to shine. 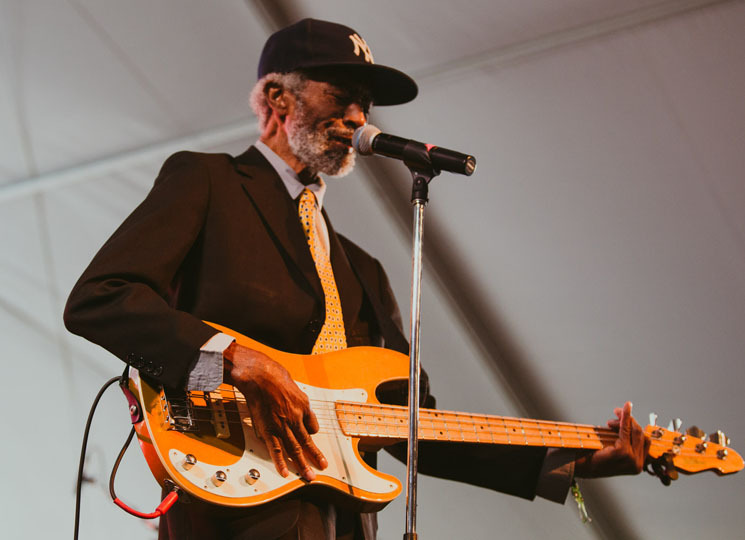 The longest-running J.B.'s member, stretching back to 1971, Fred Thomas put on a bass clinic for "Make It Funky." Tyrone Jefferson laid down the most impressive trombone solos I've ever seen, while Jeff Watkins peppered the show with scintillating saxophone, his finger work so furious it's a good thing he came to Victoria after the campfire ban was lifted or he might have torched Vancouver Island. They were joined by a couple of worthy vocalists too. On her rendition of "It's a Man's Man's Man's World," band regular Cynthia Moore challenged the soulfulness of the original recording. Afterwards, Martha High made her presence known, taking the lead on "Cold Sweat" and "Payback," noting that it was her voice kicking off the original recording, though they tweaked it to the "Big Payback" version she released in 2007. To see the fabulously appointed brass section do some synchronized martial arts moves for the "I don't know karate, but I know ka-razor" part of that track was a memory maker. Both of the singers came back to send the show home on "I Got You (I Feel Good)" and a brisk take on "Get Up Offa That Thing." A few months before this show, the J.B.'s self-released a new album, some 12 years in the making, so this wasn't just a legacy tour, but the hits, from whatever era they were recorded, were what really stuck the landing. The sheer number of enthusiastically dancing white people at the stage was impressive, and well-deserved. While their latest works may not have quite the same punch as the stuff they made with the Godfather of Soul back in the day, the J.B.'s can still kick it live as good as anyone.